Mangaluru, Apr 16, 2019: Abhishek, a victim of endosulfan poisoning, overcame all obstacles to score a first class in the second PUC examinations. When the results were announced on April 15, Monday, Abhishek of Seva Bharathi’s Endosulfan Day Care Centre in Koyla in Puttur taluk had secured first class (63%) in the Arts stream. Seva Bharathi secretary Nagaraj Bhat, in a press release, congratulated Abhishek. Seva Bharathi also thanked district administration, Health and Family Welfare Department, deputy director of Public Instruction, Uppinangady Government Pre-university College principal and scribe Lavanya. Abhishek, son of Vishwanath and Ganga Ratna from Perabe, had scored 66% in SSLC. 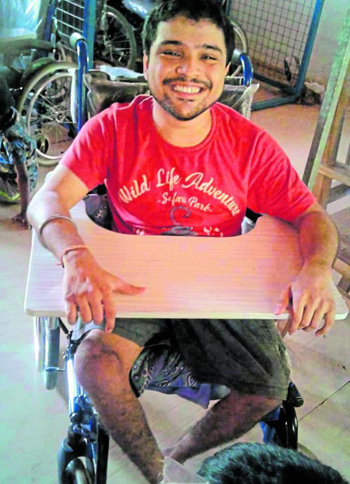 He is suffering from cerebral palsy and had availed the help of a scribe to write the exam. “Abhishek had not taken any separate tuition. Teachers at Koila Day Care Centre had helped him to pass with flying colours,” a relative said. Abhishek, when contacted, expressed a desire to pursue a bachelor’s degree.